During the construction process I draw upon a lifetime of experience working with both wood and metal. 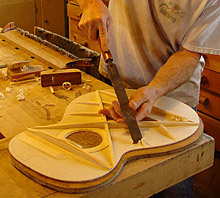 Through precision joinery and sensitivity to the woods mechanical properties, I am able to produce instruments that are both structurally sound and acoustically pleasing. In addition to the traditional techniques of flexing the wood and listening to tap tones, I employ Chladni style acoustic evaluation. 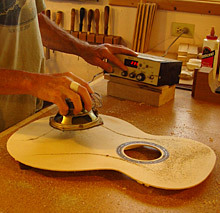 This techniques involves using a variable frequency sound wave to identify the resonances of a guitar top, back or assembled body. This information, combined with years of Chladni data collection, allows me to better control the acoustic properties of a given instrument.